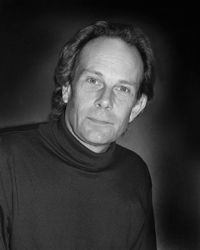 Allan Cooper is a Canadian poet and musician born in Moncton, New Brunswick in 1954.
Cooper found an interest in writing while in secondary school, and after graduating from Moncton High School, continued to pursue his passion by studying English at Mount Allison University. Cooper’s first book of poetry, Blood-Lines, was published by Fiddlehead Poetry Books in 1979. In the past thirty years, he has published an additional twelve poetry collections, including a reprise of poems from Blood-Lines which match newer poems in The Alma Elgies (Gaspereau Press, 2007). Cooper’s poetry work is extensive, including titles such as Bending the Branch (Percheron Press, 1983), Poems Released on a Nuclear Wind (Pottersfield Press, 1987), The Pearl Inside the Body (Pierian Press, 1991), Heaven of Small Moments (Broken Jaw Press, 1998), and Gabriel’s Wing (Gaspereau Press, 2004). In 1982, Cooper took over the publication of the poetry magazine Germination from his friend and fellow poet, Harry Thurston. He then went on to publish fifteen issues of the magazine, which featured the work of new and established Canadian and American poets. Cooper also founded the poetry publishing house Owl's Head Press in 1986, which ran out of his home. ​Cooper lives in Alma, New Brunswick with his wife, Laurie, where he continues to write and make music. Biography written by Tyler Lifford (Advanced Poetry Workshop). dying in the arms of their wives. Published in The Alma Elegies (Gaspereau Press, 2007). that lit the entire room. name them: Reta, Cedric, Hattie, David, John. ​Monica Grasse (ACPA Managing Editor, 2016). A two-part volume of poetry, Allan Cooper’s The Alma Elegies, pairs the poems from his very first book with new poems ​ ​ written in the same place. The first half of the book was written in the autumn of 1978, when Cooper was living alone in his ​ great-uncle’s house. These poems were published the following year in Blood-lines. Twenty-five years later, having raised a ​ family in the same house, Cooper has written a series of reflections or ‘answering poems’ about occupying that space and about the coming of winter again. Cooper’s poems “Blood-lines” and “Old Voices” work together in Dunfield’s consideration of The Alma Elegies by looking at the voices present in the surroundings of Cooper’s home and those of the past that live only in memories and the hearts of the present. The resituating of these voices works through the structure and imagery of the poems to create an echo of a voice that was once prominent around Cooper’s homestead. “Blood-lines” appears first in the collection of poems and is the original of the two considered. It is a 29-line free verse poem, compared to the poem’s echo, “Old Voices,” which has a 12-line structure. The difference in length between the two reflects the change and meaning of the voices, which Cooper has a hard time finding after years gone by. Cooper’s difficulty in finding his memories through the voices is evident in the fewer words of the second poem. “Old Voices”’s is not organized into stanzas like “Blood-lines,” therefore creating a sense of lethargy about telling the memories, or a tired sadness for the past. In contrast, “Blood-lines”’s divided, 4-line stanzas present thoughts which are purposeful and specific to explaining the meaning behind the objects surrounding Cooper’s thoughts and physical home. dying in the arms of their wives (15-18). The objects around Cooper’s house become more than mere remembrances of home; they work to tell stories, evoking memories of an enjoyed, yet now hurtful, past. However, no matter the meaning of the memories, Cooper cherishes the past because “their names/were [his] own” (19-20). The stories of death that the “pale stones” tell also contain the “blood-lines” of his family, a significance that can never be taken away, no matter the contrasting meaning of their presence (15, 23). name them: Reta, Cedric, Hattie, David, John (7-12). Despite the vivid memories of the men in his neighborhood, Cooper feels a distance with the past that no longer allows him the immediate remembrance of his “blood-lines” (“Blood-lines,” 23). Cooper’s two poems work together to create a vivid memory of the past while contrasting the significance and prominence of that memory. Depending on the imagery used to describe and distance himself from the past, Cooper questions the purpose of the past and where we fit into it as individuals who once dwelt there, but who have moved into the present. Cooper, Allen. “Blood-lines.” The Alma Elegies. Kentville: Gaspereau Press, 2007. 9-10. Print. ---. “Old Voices.” The Alma Elegies. Kentville: Gaspereau Press, 2007. 34. Print. Dunfield, Gary. Back Blurb. The Alma Elegies. By Allan Cooper. Kentville: Gaspereau Press, 2007. Print. Cooper, Allan. Alma Elegies. Kentville: Gaspereau Press, 2007. Print. ---. Bending The Branch: Twenty-six Poems. Sackville: Percheron Press, 1983. Print. ---. Blood-Lines. Fredericton: Fiddlehead Poetry Books, 1979. Print. ---. The Deer is Thirsty for the Mountain Stream: Version from the Chinese, Japanese, and the Book of Psalms. Alma: Owl’s Head Press, 1992. Print. ---. Everything We've Loved Comes Back to Find Us. Kentville, NS: Gaspereau Press, 2017. Print. ---. Gabriel’s Wing. Kentville: Gaspereau Press, 2004. Print. ---. Heaven of Small Moments. Fredericton: Broken Jaw Press, 1998. Print. ---. Hidden River Poems. Fredericton: Fiddlehead Press, 1982. Print. ---. Jottings Toward the Country of the Light: 10 Ghazals. Brandon: Pierian Press, 1984. Print. ---. Lin Chu: The Black Swan. Alma: Owl’s Head Press, 2006. Print. ---. The Pearl Inside the Body (Selected and New). Brandon: Pierian Press, 1991. Print. ---. Poems Released on a Nuclear Wind. Lawrencetown: Pottersfield Press, 1987. Print. ---. Singing the Flowers Open. Kentville: Gaspereau Press, 2001. Print. ---. To An Unborn Child. Fort Collins: Leaping Mountain Press, 1988. Print. ---. Toward a Country of Light: New and Selected Poems 1978-2018. Lawrencetown, NS: Pottersfield Press, 2018. Print. ---, and Harry Thurston. The Deer Yard: A Winter Cycle. Kentville: Gaspereau Press, 2013. Print. Cooper, Allan. “’I Must Write the Poem’: A Review Article on John Thompson’s Stilt Jack”. The Antigonish Review 42 (1980): 91-98. Print. Butler, Joel. “A request.” Email to Allan Cooper. 2 April 2009. Cain, Michael Scott. “Rev. of The Alma Elegies.” Rambles.net . 15 Dec 2007. Web. 11 May 2009. Cook, Geoffrey. “Rev. of Singing the Flowers Open.” The Danforth Review Online. N.d. Web. 11 May 2009. Cran, E.E. “Two Volumes Show Part of Range of 21st-Century Poetry.” New Brunswick Telegraph-Journal 4 Sept. 2004: Life Section. “Local Author Releases New Book of Poetry.” Times and Transcript [Moncton, N.B.] 24 Mar 2007: E5. Lofranco, John. “A Review of Gabriel’s Wing.” Books in Canada Online. N.d. Web. 11 May 2009. MacGibbon, Lynda. “Hummingbirds, Poets, Clay Boxes.” Times and Transcript 3 July 1999: Life Section. Morrissey, Stephen. “Review of Three Poetry Books.” Rev. of Poems Released on a Nuclear Wind Fall 1989. Web. 19 May 2009. Nowlan, Michael O. “Collection includes several local poets.” The Daily Gleaner [Fredericton, N.B.] 26 May 2007: C3. Robinson, Heather. “N.B. Writer’s [sic] Federation Founders Honoured.” The Daily Gleaner 17 May 1999: News Section. “Writers to Read at Moncton Library.” Times and Transcript. 29 March 2007: B8.